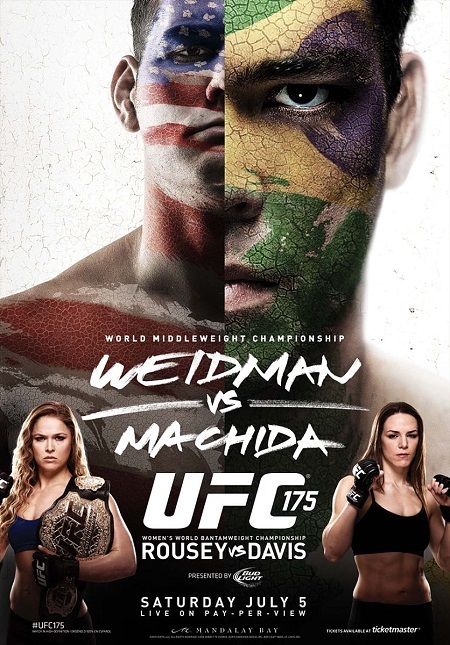 “UFC 175: Weidman vs. Machida” is officially jumping off inside Mandalay Bay Events Center in Las Vegas, Nevada. UFC Fight Pass kicks off tonight’s festivities by streaming the first two preliminary bouts at approximately 7PM ET/4PM PT. Middleweight champion Chris Weidman defends his throne against Lyoto Machida in the show’s featured attraction. Reigning bantamweight champion Ronda Rousey puts her strap up for grabs against Alexis Davis in the co-main event. 1stRound: After some standup action, Doane takes Brimage down and passes into side control. Brimage gets his back taken and defends well to get back to his feet. 10-9 Doane. 2ndRound: Brimage briefly stuns Doane with a right hook, but can’t score the takedown. Looks like Doane has recovered quicklky. Brimage puts Doane down with a leg kick, Doane is clearly favoring the leg now. 10-9 Brimage. 3rdRound: Doane is continuing to take damage on his leg, the redness is starting to worsen. Doane lands a front kick to Brimage’s face and throws a couple knees to the body. 10-9 Doane. 1stRound: Santos lands several leg kicks, Hall answers back with counter punches. Hall takes a couple more hard leg kicks and begins to limp on his lead leg. Hall is starting to take control with his punching, doing his best Roy Jones Jr. impersonation. 10-9 Santos. 2ndRound: Between rounds they show a close-up of Hall’s feet, it appears that one of his toes is crooked. Santos attacks Hall’s leg and follows it up with a punch, Hall shakes his head claiming that no harm was done. Hall slips on a whiffed spinning back kick but is able to avoid taking any damage. 10-9 Hall. 3rdRound: The doctor checks on Hall again prior to the final stanza starting, but Hall plays it off well and is allowed to continue. UFC posts a shot of Hall’s foot that shows his bone poking through the skin. Santos takes an overhand right from Hall and continues to move forward. Hall lands a spinning back kick to Santos’ body with his injured foot. Santos clinches Hall against the cage and lands several knees to Hall’s leg, Hall uses a kimura to try and reverse as the bout comes to an end. 10-9 Hall. 1stRound: Rousey lands an overhand right, a knee and throws Davis right into side control and begins to pound on Davis’ face. The referee jumps in to stop the bout, Davis continues to try and grapple with Yves Lavigne’s leg. 1stRound: Weidman uses lots of kicks early, when Machida finally throws one himself Weidman tries to catch it but fails in his first takedown attempt. Weidman tests Machida’s chin early with a couple punches. Weidman eats a Machida straight left. 10-9 Weidman. 2ndRound: Machida is circling a lot as Weidman continues to stalk him down. Weidman nearly catches Machida coming in with a punch. Weidman shoots in for a takedown after eating an overhand left and gets it right in front of his own corner. Machida takes a couple of knees as he stands up. 10-9 Weidman. 3rdRound: Machida avoids two takedown attempts early on, but the third time was a charm for the champion. Weidman catches Machida with a couple of punches and follows it up with a right that opens Machida up with a cut. Weidman scores another takedown. 10-9 Weidman. 4thRound: Weidman calls for more as Machida lands a hard kick to his body. Machida lands a two punch combo and fights off another Weidman takedown attempt. Big left hook lands for Machida, Weidman looks to be slowing down a bit, breathing deeply out of his mouth. Weidman takes another hard kick to his body, Machida is the one controlling the center of the Octagon now. Machida lands a straight left as the round ends. 10-9 Machida. 5thRound: Machida lands a leg kick, you can see the bruising around Weidman’s right side. Weidman’s kick gets countered by a Machida punch, Weidman is struggling to take Machida down. Weidman lands a right, both fighters are exchanging now. Weidman lands a head kick. Weidman lands a big right elbow that stops Machida in his tracks and busts up his face even more. Weidman finally gets the takedown he’s been looking for. Weidman takes Machida’s back Machida hurts Weigman with a punch and throw a flurry as the fight ends. 10-9 Weidman.